This is the second post in the Cancun series. From my previous post (Ah Cacao in Cancun), you know that we went to the La Isla Shopping Mall in the Hotel Zone to check-out Ah Cacao Chocolate Cafe. Right across from that cafe is Taco Grill. We did not set out to have lunch at Taco Grill. We were keen to eat tacos at a roadside shack called Tacun in the Hotel Zone (you know, we want to eat where the locals eat, even if we restrict ourselves to the Hotel Zone!). After an unsuccessful attempt to find Tacun (we probably drove by it a few times and missed it every time), and since we were already in La Isla Shopping Mall, we went to Taco Grill for lunch – only because it was right across from Ah Cacao Chocolate Cafe, and we had no patience or inclination to find another place to eat lunch. Taco Grill is not a fine-dining restaurant and it’s in a shopping mall, so that set our expectations quite low. We thought that we cannot go too wrong with ordering tacos at a Taco restaurant in Cancun and we were not disappointed. 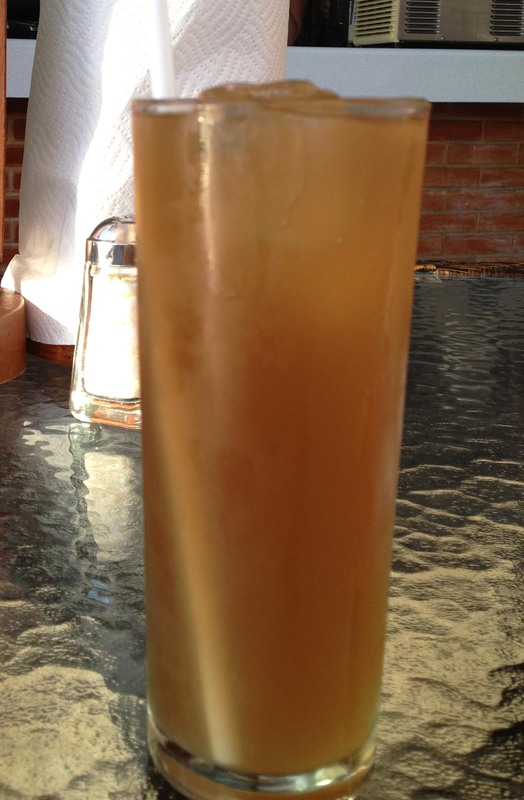 Tamarind margaritas are very popular in Cancun and in Playa del Carmen. It ought to have been no surprise for me that this was a sweet, tamarind drink, but I was surprised to see the drink listed on the menu. I was very intrigued by this drink and had to order it. It tasted sweet and sour, but also felt dilute. I won’t order it again, although it was a welcome thirst quenching drink in the afternoon heat. We got the guacamole. In NYC’s Mexican restaurants, we are often asked if we want the guacamole mildly spicy, medium spicy or hot, and in restaurants such as Dos Caminos, guacamole is made table-side with a traditional mortar and pestle. No such luck at Taco Grill. 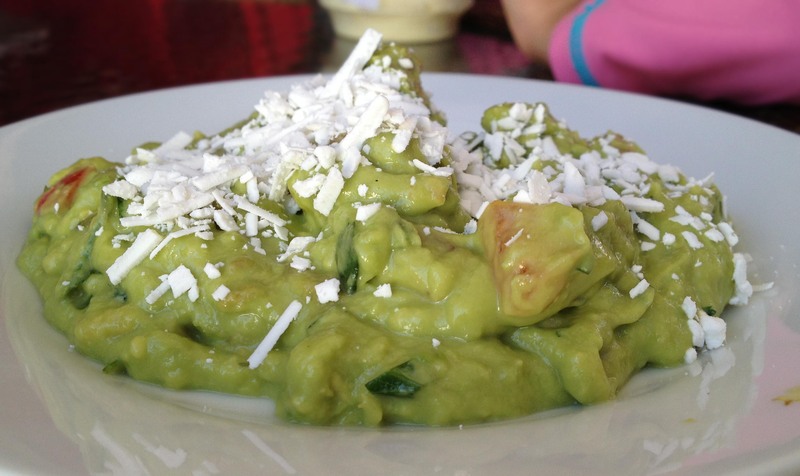 The guacamole was topped with crema fresca (fresh cream?). Back in NYC, I have hardly seen guacamole being served with cream / cheese. The guacamole was good, not too cold, with adequate lime for acidity and enough pico de gallo and salt to keep it from being uni-dimensional and boring. The sprinkling of fresh cream did not add much flavor or richness to the guacamole, but did not take away from it either. The guacamole was served with tortilla chips. The tortilla chips were crispy and slightly salted, just as they should be. We ordered the tacos and could choose 4 different tacos in one plate. 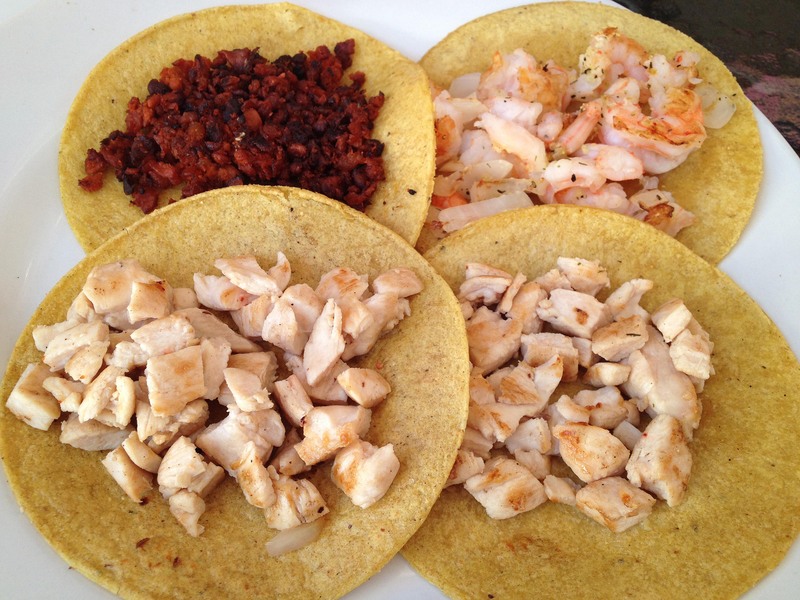 There were no vegetarian fillings for the tacos, and we do not often get to eat shrimp and chorizo tacos in NYC at the Mexican restaurants we frequent, so we choose the chicken, shrimp, and chorizo fillings. 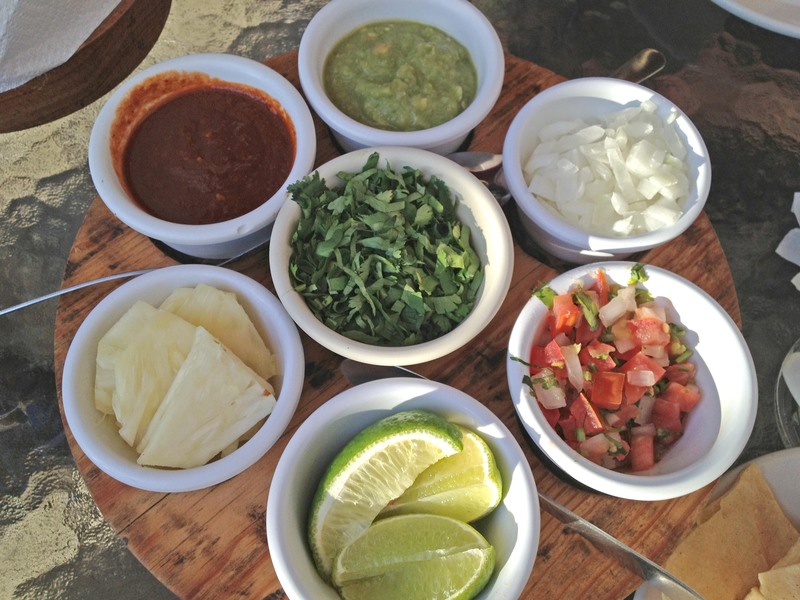 The tacos arrived with a plate of sauces and toppings. There was a chipotle sauce that was mildly spicy, but threatening to be very spicy and a deep red in color, and a habanero sauce that was extremely spicy. The toppings were pineapple, onion, pico de gallo, and cilantro. The tacos were quite good, though not extraordinary. The grilled chicken was well cooked, flavorful and not too dry. The shrimp in the tacos were small, but again well cooked and full of flavor. The chorizo was mildly spicy, smoky as though it was cooked with smoky chipotle or some other pepper. It’s tough for me to pick a favorite between the shrimp and the chorizo. Now for the cactus leaf salad. Cactus leaf is not one of my favorites, but it was one of the salad ingredients and if we do not try eating cactus leaf in Mexico, where else will we try it (besides NYC of course?!!). This salad was like the fajita (grilled peppers) that we get in Chipotle Mexican Grill. 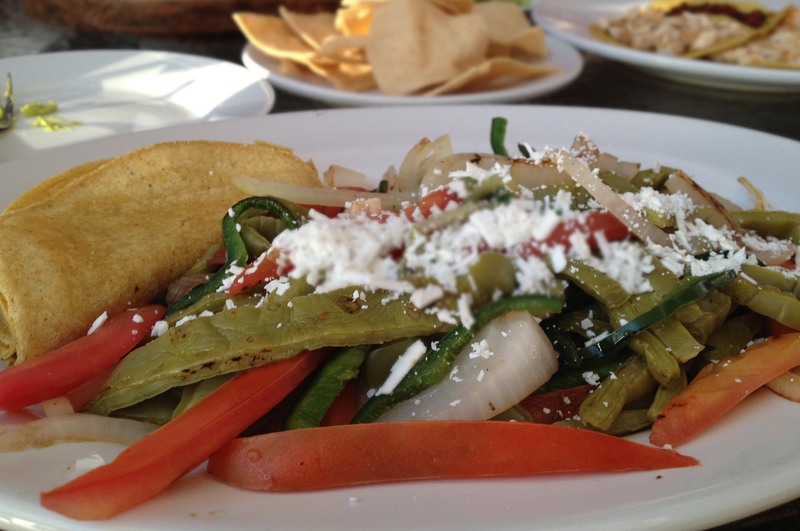 The salad had strips of cactus leaf, red and green bell peppers, and onions, and some fresh cream / crumbled cheese on top. The cactus leaves were somewhat soft, squishy, and slightly slippery in texture. The salad was served with a couple of soft tortillas. These soft tortillas were bright yellow and bore grill marks on them. The corn tortillas that I have seen and eaten in NYC are typically pale yellow or white, so perhaps the soft tortillas were not made of corn but from wheat? One will never know, because I did not ask. The verdict about Taco Grill? What else can one do at La Isla Shopping Mall? There is an aquarium very close to Ah Cacao Chocolate Cafe and Taco Grill. If you time it well, you may be able to get pictures with dolphins and watch a dolphin, sea-lion show too, as we did. The show is particularly exciting for children. 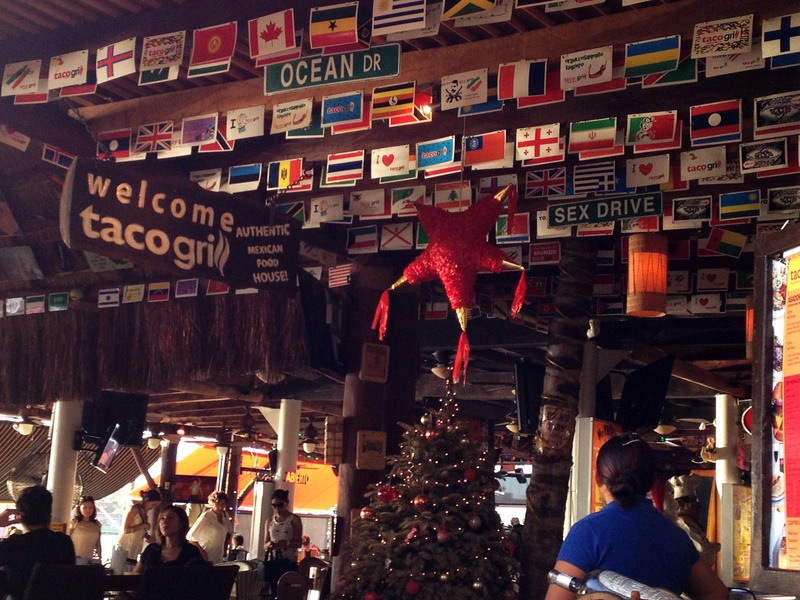 ….. More Cancun experiences to follow in the next few posts.